by Chris Woodford. Last updated: December 22, 2018. Need to stop a shed roof going rusty? Want to shake off a niggling cold? Afraid of getting sunburned? Looking for a handy way of storing electricity in a battery? Think zinc! Not as valuable as platinum or gold, less shiny than silver or copper, zinc is certainly one of the least glamorous metals—right at the end of the alphabet where you don't notice it. But that doesn't make it any the less interesting or useful. Let's take a closer look at one of the metallic heroes of everyday life! 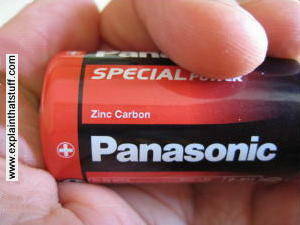 Photo: Zinc in action in a typical zinc-carbon battery. Unfortunately, you can't see the zinc in this picture (it makes up the negative electrode) but if you're curious to know where it is, look at Wikipedia's cutaway of a zinc-carbon battery. 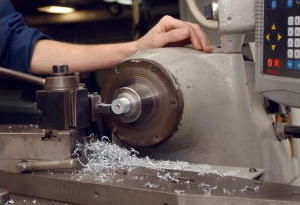 Photo: Zinc in its solid form being worked on a lathe. Photo by William Weinert courtesy of US Navy. A reasonably shiny, blueish-white metal, zinc is one of the 92 naturally occurring chemical elements—the 24th most common in Earth's crust. "Common" is not quite what you might think, however: dig out a tonne of Earth and you'll find it contains a measly 65 grams (2.3 oz) of zinc! If you're chemically minded, you'll find zinc in group 12 (formerly IIb) of the periodic table where its neighbors are copper and gallium. It's a transition element—one of those elements in the center of the periodic table whose properties are slightly less predictable than the elements in the groups at the outer edges. Photo: Zinc in its liquid form. It might look like hot water pouring from a kettle, but it's actually molten zinc at the horribly high temperature of 524°C (975°F)—over five times the temperature of boiling water! Zinc is a solid at room temperature but melts into a liquid above 420°C (787°F). Photo by Janice Kreischer courtesy of US Navy. 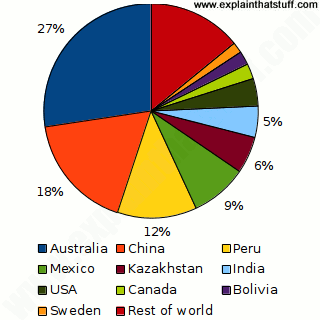 Chart: World zinc reserves: There are substantial zinc reserves in many countries, as this pie chart shows. As of 2018, world zinc mine production was estimated at about 13.2 million tons (up 5 percent from 2016) and total world zinc reserves were estimated at 1.9 billion metric tons. Source: U.S. Geological Survey, Mineral Commodity Summaries: Zinc, January 2018. Like most other metals, zinc doesn't occur in its pure form in nature but combined with other elements in minerals such as zinc oxide, zinc silicate, and zinc carbonate. It's the usual story! If you want the pure zinc, you need to take huge truckloads of a raw, zinc-containing mineral and put it through a multi-stage refining process (involving several separate physical and chemical steps) to remove the other elements. Starting out with zinc sulfide, for example, you grind it up into a powder, wash it to get rid of the sulfides of other metals that are usually mixed in, and eventually you end up with zinc oxide (ZnO). You leach this (react it with sulfuric acid) to get a solution of zinc sulfate in water. Then you use electrolysis (an electro-chemical process similar to a battery working in reverse) to separate out the pure zinc metal. 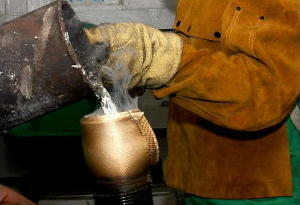 You can also produce zinc from its minerals by smelting (heating with carbon); traditionally, that's how it was made. If someone shows you a piece of zinc, it will probably look dull grayish-white. But what you're looking at will be zinc oxide, which forms when zinc reacts with oxygen in moist air; pure zinc is actually a shiny, blueish, whiteish, silverish sort of a color. Zinc isn't like iron (the kind of super-tough metal you'd use for building bridges): it's normally very brittle. But heat it up to about 100–150°C (212–302°F) and it becomes malleable (easy to bend and work), so you can make it into a variety of shapes or roll it into thin sheets. Like other metals, zinc is a crystalline solid: atoms of zinc lock together into hexagonal close-packed (HCP) crystals. 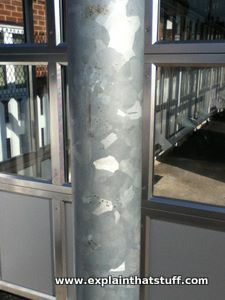 Photo: This steel lamp-post has been protected from corrosion by coating it with a zinc compound, through a process called hot-dip galvanization. It's easy to recognize steel treated this way from the large crystal pattern on its surface, which is known as spangle. Most zinc is used in galvanization. Galvanizing is a process based on electrolysis that involves covering iron and steel with a thin, protective layer of zinc (which is converted to zinc oxide and then zinc carbonate by oxygen and carbon dioxide in air) to prevent rusting (corrosion) in moist air or water. All kinds of everyday things are galvanized, from metal roofs and gutters on buildings to water tanks inside people's homes. Quite a lot of zinc ends up in disposable, zinc-carbon batteries (the cheapest, everyday, non-rechargeable ones). Making brass is another leading use for zinc. Zinc readily forms a variety of useful compounds such as zinc sulfide (a phosphor used in old-style cathode-ray tube televisions and oscilloscopes, fluorescent lamps, and luminous paint), zinc sulfate (used as a weedkiller and in textile manufacture), zinc oxide (an additive and catalyst used to make rubber and improve the properties of such diverse things as plastics, paints, inks, concretes, sunscreens, and cosmetics). A number of well-known alloys include zinc. Brass, for example, is made from copper and zinc; dental amalgam, gunmetal, and some types of solder also contain zinc. 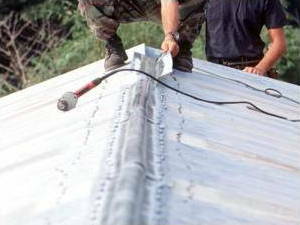 Photo: Putting a new galvanized roof on a building. Photo by Michael Featherston courtesy of Defense Imagery. Perhaps surprisingly, the zinc that stops your water tank going rusty is also—even as you're reading this—helping your body to stay healthy. You may have noticed that all kinds of cough and cold remedies contain zinc, as do vitamin tablets and supplements (and many breakfast cereals). Zinc deficiency is linked with many different health problems and illnesses, but doesn't really affect people in affluent nations, such as the United States, where most enjoy a good diet; it's much more of a problem in developing countries. Photo: Zinc oxide fabric has a variety of useful properties, offering resistance to heat and ultraviolet light. Some scientists think this material could be used to make clothes that would automatically generate electricity as you walk along! 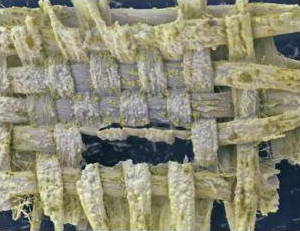 In this electron microscope photograph, you can clearly see the woven fabric fibers. Photo courtesy of NASA Glenn Research Center (NASA-GRC). No-one knows exactly who first discovered zinc or put it to use, but archeologists have discovered zinc-based alloys in sites dating from prehistoric times. We also know that the Romans (whose empire flourished in Europe from 27BCE to 395 CE) made brass coins from copper and zinc, although they didn't recognize or identify zinc as a pure metal. Another millennium passed before people began to use zinc as a metal by itself. Historians think this first happened in India in the 13th century; about 300 years later, the Chinese were producing zinc on a large scale. The modern age of zinc began in the mid-18th century and two Europeans share the credit. In 1737, English metallurgist William Champion (1709–1789) developed and patented the process of making pure zinc by smelting calamine (zinc oxide and iron oxide) with charcoal on a huge, industrial scale. Zinc was finally recognized as an element in 1746, thanks to the efforts of a German chemist named Andreas Sigismund Marggraf (1709–82), who used similar techniques to Champion to study zinc in detail in his laboratory. 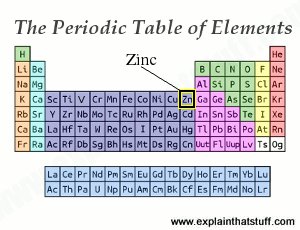 Artwork: The periodic table of the elements showing zinc (among the transition elements). Note how zinc (Zn) is right next to copper (Cu)? That means the two atoms are of very similar size, which is why zinc atoms can easily replace copper atoms to make the extremely useful substitution alloy we call bronze. Atomic number: 30 (one zinc atom contains 30 protons, 30 electrons , and 34–40 neutrons, depending on the isotope). There are five stable isotopes, the most common of which are zinc-64 and zinc-66. Zinc: Packed with interesting information, this is a longer introduction to zinc—and one of Wikipedia's featured articles. USGS Minerals: Zinc Statistics and Information: Detailed and definitive information about world zinc production and trends. Dietary Supplement Fact Sheet: Zinc: Reliable information about zinc in the human diet from the US Government's Office of Dietary Supplements/National Institutes of Health. Periodic Tales: The Curious Lives of the Elements, from Arsenic to Zinc by Hugh Aldersey-Williams. Viking, 2011. Zinc is covered in part three in the chapter "Au Zinc." 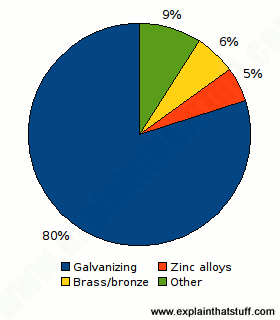 Zinc and its Alloys and Compounds by S.W.K. Morgan. Ellis Horwood, 1985. Zinc by National Research Council (U.S.). Subcommittee on Zinc, University Park Press, 1979. An old book, but still worth a look (the basic chemistry of the elements doesn't date). 2000 Years of Zinc and Brass by Paul T. Craddock. British Museum, 1998. A detailed historical study of zinc from antiquity to the present day. Zinc by Leon Gray. Benchmark Books, 2006. A short, 32-page overview of zinc's chemical and physical properties, its use in technology and crops, and its importance to the human body. Ages 9–12. Zinc by Kristi Lew. Rosen Group, 2008. A longer, 48-page introduction focused more on the chemistry of zinc and its compounds. Ages 9–12. Zinc by Salvatore Tocci. Scholastic, 2008. This is a similar 48-page guide for the same audience. Ages 9–12.